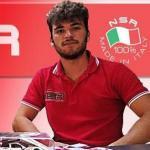 Andrea Noviello has taken the reins of NSR, injecting air of youth to the brand but genetically marked by Slot DNA who transmitted his father, Salvatore Noviello sadly disappeared in 2013. We understand that it has to be complex to generate the appropriate empathy between some fans and slot sector structures that are generationally something far from your exciting business vision. SlotCar Today.- What can a rejuvenated NSR offer to the current slot sector? Andrea Noviello.- I am not only a business man, I really love to race with slot cars. I race with slot cars from I was a child. My father introduced me in this fantastic world and I really like it. So it is before my passion, and after my work. I do it with pleasure, so I would like to offer the spirit of a very slot racers, who like competitions, fast cars, amazing performances, best quality. These are NSR main principles that we would like to offer to the slot sector. SCT.- The slot sector has dynamics closely linked to a specific profile. How do you make understand to a young enthusiast that a new modern car is offered with a fictitious livery of the seventies? Is this the clear definition of what slotcar is today? A.N.- Clear, the principle of working than a slot car is the same then 1970’, but it is just its own identity, and you can’t change it. Anyway, there has been a big improvement of the slot cars: nowdays you can buy a Ready To Race slot cars with very high performance and quality, as NSR cars. You can tuning the cars, with different tyres, motors, suspension kit etcetera. Slotcars are very fast, brilliant esthetics, and unbelievable quality. Very different than seventies. SCT.- Made in Italy. What is the point today in defending this productive policy? At a difficult time in the hobby sector, business profitability should not be a priority in order to maintain a position in the market? A.N.- Easy: NSR offers the best quality. We are not interested to do the “cheaper battle”. We work to have the best quality, even if it costs so much for us and our profit is lower than other car manufacturer. NSR is many times WORLD CHAMPION, we make professional slot cars, not toys for kids. You buy NSR cars and you need just to put them on the track, and you can race without changing anything. SCT.- In a few years it has gone from a vast catalogs proposals to drastically reduce planned developments annually. This requires a more studied choice of projects. What criteria does NSR follow to choose its future models? A.N.- It is not true! Some years before we made 12 cars (different liveries) per year, now we do 24 cars per year! Nowdays we offer a very vast catalogs of products, and we made brilliant liveries even if they are so complex. About new models, we developed the best GT3 NSR, the Chevrolet Corvette C7R and probably the best Classic NSR, the Porsche 908/3. We are always working on new products, it is really important for us. SCT.- For decades, victories in racing made selling cars. NSR today seems to want to promote slot championships where high visibility is given to the winner and his car. Is it still valid that the races sell cars? A.N.- Of course, it is true. We are working on a very important NSR race in Spain, it is “work in progress” but I can say that we will do one of the BEST NSR events in Spain!!! SCT.- NSR is constantly evolving its products seeking to raise performance. Does this mean that NSR believes that the slot racing market is large enough to take on this R + D investment? A.N.- Of course. Our products are for racing, so we need to always improve them. We made a lot of R&D, and we invest a lot of money in that. SCT.- NSR wants to promote their products become "must" for their sporting career, prioritizing the diffusion through clubs and the "mouth to mouth" of the fans. Does not limit this a greater introduction of the product? A.N.- I think not, we are doing a lot of advertising in many different way, on our Facebook page, Instagram, Website, Youtube etc… Fans can follow us and see our products. We are also working to let the people know our brand. NSR is a racing brand, so our “natural habitat” is the track, so we need to work and work with the slot club. SCT.- All slot car manufacturers, in addition to creating a leading product, have to face the limitations of the different slot racing regulations. How is a new car developed with the variety of regulatory options? An NSR car out of the box can compete in any regulation? A.N.- It is hard to say! Actually there is not a official federation which have official rules for all producers. Anyway, NSR cars are designed to race for 99% of the regulations, but if someone would like to race with their own strange rules, we can’t do so much. SCT.- NSR has also entered the dynamics of providing fictitious liveries on their cars. We understand that it is a marketing option, which allows to amortize some molds that with the real versions it would hardly get. Does not this approach the slot hobby to the toy? We have NEVER entered in this dinamic!! If you look to our cars you can see how much they are complex, you can also see one of the last Corvette C7R, code 0046 or 0077. NSR do a extremly hard work on the body, with TWO pad printing machines, about 120 printing step per car!!! We made realistic liveries or sometimes invented liveries, because people also like this. We made 3 check control on EVERY BODY: after painting, after pad printing, after finish assembling. Our liveries are really perfect with an unbelievable quality, and people know and like this. SCT.- When a design is reduced to the 1:32 scale, certain measures must be compensated to make the model visually attractive to the eye. You can take advantage of this diversion of dimensions to improve the car's behavior on the slot track? A.N.- Yes, of course. We are a racing brand, so if I need to do some technical changes I have no problem. Slot cars must be perfect on the track, not only on the table in your bedroom, this is NSR philosophy. Racing slot cars, really good also in the esthetics, but the first parameter is the track, the race. SCT.- The next planned and announced NSR model will be the Mercedes AMG. It will also be a "Rennsport" (Ready to Racing) car? A.N.- NSR cars are always Ready To Race, and it is seriously, not only written on the box. Mercedes AMG have some new technical changes, we made an hard R&D work. You will see everything, it is coming soon. SCT.- When will be announced the NSR Grand Prix schedule races in the different countries? Will they be Open races or only for drivers from each country? A.N.- We are working on that. It is still work in progress, so I would like just to say that we are developing a big NSR events, in Spain, and in other country. We will start from the Spain, so I will let people know everything as soon as.